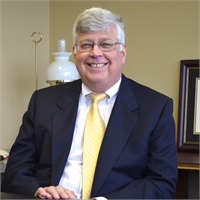 Larry F. Boord, JD, CLU, ChFC | Retirement & Wealth Planning, Inc.
Larry is a 1975 graduate of the Ohio Northern University College of Law. Admitted to the Ohio Bar in 1975, Larry does not practice law. Larry received his CLU (Chartered Life Underwriter) designation from the American College in 1980. Larry obtained his ChFC (Chartered Financial Consultant) designation in 1985 from the American College. Both the CLU and ChFC designations are awarded by the American College, supported by the Society of Financial Service Professionals and demonstrate a commitment to knowledge, continuing education and the industry. Members of the Society of Financial Service Professionals are committed to a professional pledge of service and advice in the best interest of clients. Larry is a licensed life and health insurance agent. Larry is a resident licensee in Ohio and a nonresident licensee in other states. Larry is a field representative with the The Guardian Life Insurance Company of America, New York, NY. Boord & Associates has contractual agreements with numerous other insurance companies. Our primary focus is to serve the insurance needs of our clients. Larry is active in his local community and serves in various boards and organizations.